"Often defined more by their function than their form, chests are distinguished most by their size, surface and architectural elements. Look for smaller dimensions, a nice old surface or great paint and architectural elements like molded tops, variable drawer arrangements, nice wood grain on the drawers and pronounced feet. 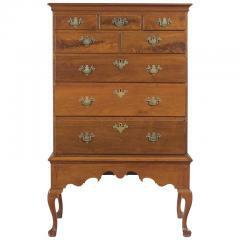 If there is a chest you are looking for and do not see, please call or email, we may not have cataloged it yet." 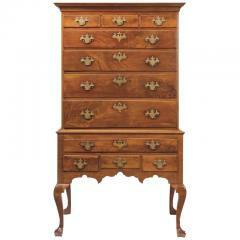 Walnut Queen Anne chest on frame. Three over two over three drawer arrangement. Original plate brasses. The base has scolloped aprons and cabriole legs terminating in trifit feet. Chester County. A very rare Unicorn painted blanket chest with three panels in the front the center showing two black unicorns rearing up which is flanked by two panels of flowers and birds. There are two more simplier designed panels on either end and three more painted panels on the lid of the blanket chest. The chest sits on shoe feet. 18th century walnut Queen Anne highboy with beautiful grain three drawers over four in upper case and one over three on base still retaining it's original plate brass cabriole legs terminating in trifid feet. 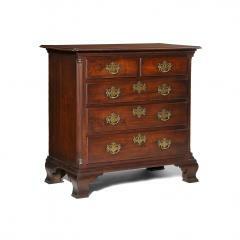 Walnut flat top Queen Anne highboy with great figured wood and drawer arrangement nicely scalloped aprons cabriole legs with shells on the knees terminating in bold triffid feet still retaining its original brasses. 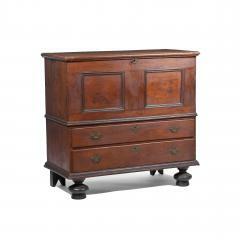 This William and Mary chest of drawers has paneled sides, ball feet in the front and stile feet in the rear. It has brass drop pulls and engraved escutcheons. 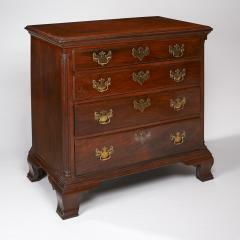 This chest is attributed to William Beakes of Philadelphia. 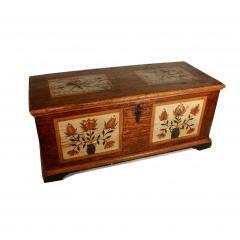 A rare and bright blanket chest in brilliant reds contrasted with blacks. The decoration is nicely painted with urns and flowers flanked by pillars and hearts on the corners. 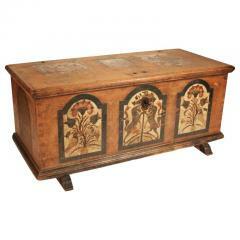 There is decoration on the sides and traces of decoration on the top. 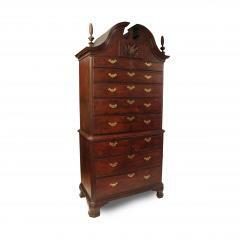 It has two drawers and bracket fee with original brasses. 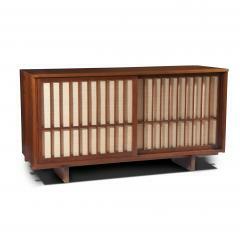 This example of a studio piece by George Nakashima is rectangular in form with dual sliding pandanus cloth doors. The right interior bears four drawers, while the left side has two adjustable shelves. It rests on a vertically positioned two-board base. 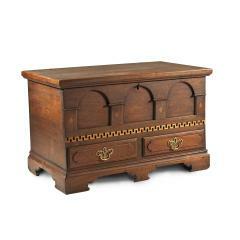 An exceptional example of the Long Island form, this blanket chest has a molded lid, double sunken panels on the case with an engraved escutcheon and mid-molding over two drawers with brass pulls and engraved escutcheons. The case rests on a black painted mid molding over two bold ball feet in the front and boot-jack feet in the back. 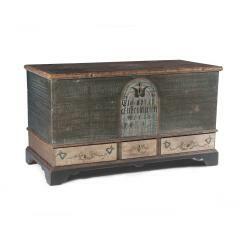 With an old dry surface, this green painted blanket chest has a white tombstone with a brown edge painted in the center with "Elisabeth Enderleinich, 1817" written upon it. A mid molding separates the green background from 3 white painted drawers with green tulips over a black base molding connecting to black painted bracket feet. 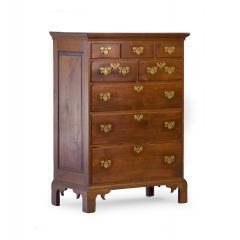 This diminutive chest of drawers has a nice finish with a molded top with notched corners, a two-over-three drawer arrangement with original Chippendale brass over a base molding and ogee feet. 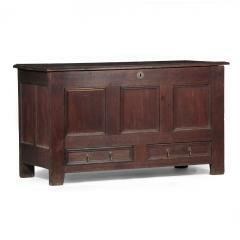 A warm walnut finish helps to emphasize the inviting architectural features of this blanket chest. 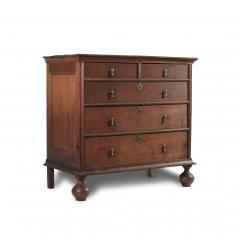 It has a molded lid with iron strap hinges sits over an engraved escutcheon on the case with exposed dovetails and a front facing mid-molding over two drawers with engraved escutcheons and brass pulls over a base molding and ball feet. This chest does not have a till. 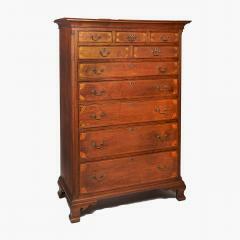 The characteristics of this semi high chest are uniquely Chester County. Specifically, it has inverted spurs on the feet and exposed dovetails seen in this region. 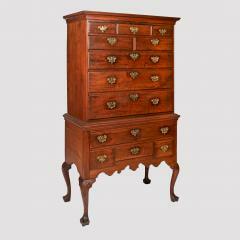 This chest also has a top molding with a three over two over three drawer arrangement, original plate brasses, a base molding, bracket feet with the raised panels on the sides and inverted spurs. 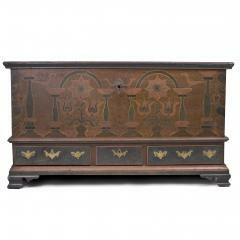 A very ornate and unusual blanket chest with applied architectural façade, Greek key waist and diamond inlay on the arcade stiles in contrasting maple, and shaped astragal ended false panels worked on the drawer fronts. 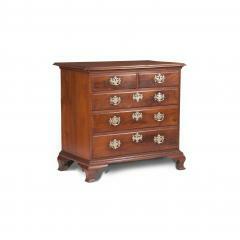 The ogee feet and drop are nicely scalloped and considerably bold for the proportions of the chest. 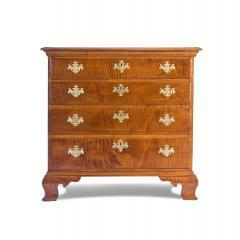 A desirable chest of drawers with a diminutive narrow size with highly desirable figured tiger maple. 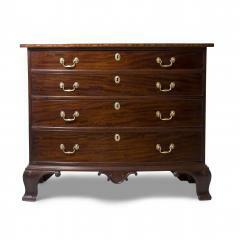 It has a molded top, with a four drawer arrangement, molded base and ogee bracket feet. 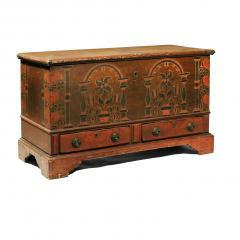 Top with oval and circular inlay along the edge, four drawers, highly carved dropped pendent with volutes and uniquely carved ogee feet with volutes. 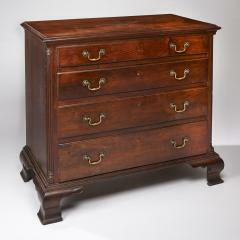 Dated 1769, this dower chest is one of the earliest known. 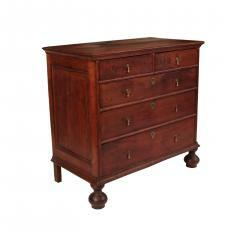 Made more exceptional by the existence of original paint on the top, sides and front of the chest. Has 8 birds illustrated on the top and front of the chest with red, black and blue paint decoration on a brown grain painted background with bird-feet decoration on all sides of the chest.